At certain points during Tangled Thoughts of Leaving‘s utterly tumultuous set at The Rosemount Hotel on Saturday, I thought I was having an out-of-body experience, so totally engrossed I was in the silent movie playing in my head that the band was soundtracking/ directing with their deafening, evocative and mind-blowing brand of instrumental rock. Saturday’s show was Tangled Thoughts of Leaving’s album launch in support of excellent new long player No Tether. To this end, the band gathered three of their favourite local bands in attempt to rock the good ol’ Rosemount to its very foundations with generous slabs of audacious, envelope pushing, strictly non-conformist, genre defying rock. And no band – local or otherwise – does balls-to-the-wall, genre defying quite like Tangled Thoughts of Leaving. 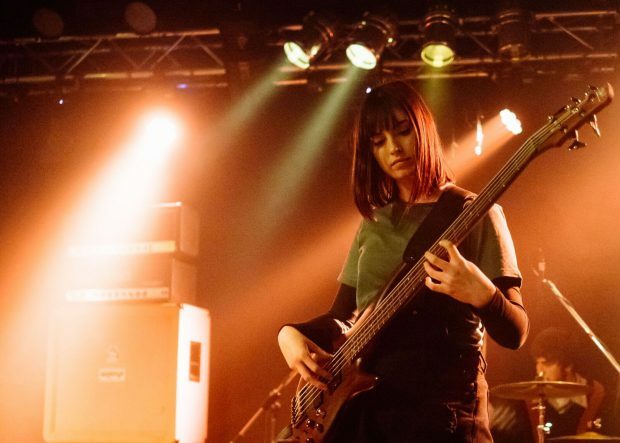 Their new album No Tether has been touted as “a wild exercise in post-metal, prog and doom-jazz” and while that description sounds pretty out there, it doesn’t really come close to describing how totally freaky they sound in the flesh and in the moment. Live, Tangled Thoughts of Leaving are unlike most other acts – an untamed feral beast finally uncaged and allowed to roam free and wreck havoc on unsuspecting bystanders. Trying to harness the raw power and explosive energy of their live show for posterity, one suspects, is very much like trying to capture lightning in the bottle and having just witnessed them do their thing live, I really can’t imagine enjoying the band any other way than on stage. On the night, the band played eight songs – a long set by their standards, according to keyboardist Ron Pollard – five of them from the new record. But in the eye of the storm (read: right up by the front of the stage in front of some monster PA speakers) , song titles really don’t mean much, not when you are holding on to your composure by the skin of your teeth whilst all hell seemingly breaks loose in front of you. The band brought along several studios worth of equipment for the show and it all seemed to be turned up to the max come showtime. With everything going at full tilt, one doesn’t think about things like how totally insane a song like Binary Collapse sounds or how the first three songs of the set – Sublunar, The Alarmist and Cavern Ritual – are also the first three songs of the new album and how the songs have been expertly meshed together to sound like both the apocalypse and a new dawn rising. No, the only thing going through your mind when you are front and centre at a Tangled Thoughts of Leaving show is what a totally kickass drummer Ben Stacy is and how expertly he steers the band’s music, like some battle-hardened captain of an old wooden warship; or how Paul Briggs’ guitar sounds more tornado than musical instrument most of the time; or how bass player Luke Pollard is able to trigger those shuddering samples that sound like earthquakes without running for cover or how Ron the keyboardist must be a classical music geek they way he is able to execute those intricate piano runs. And then you have an out of body experience whilst watching the silent movie in your head and you totally love it. Joining Tangled Thoughts of Leaving on their launch night were three talented local acts with their own new releases in the offing. 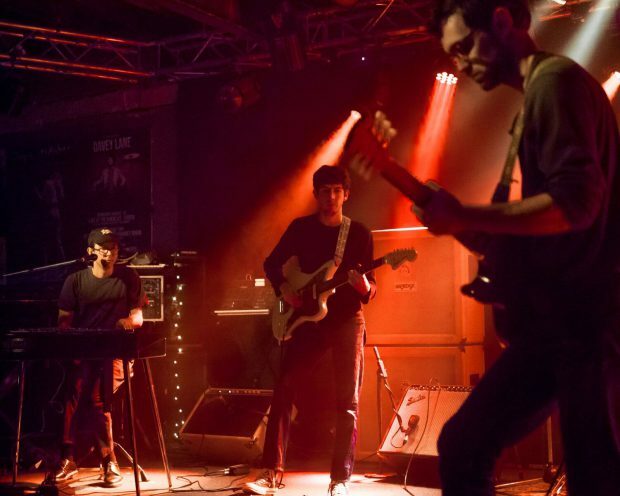 First up on the night were Yomi Ship, an experimental, instrumental three-piece blessed with youth as well as the show-stealing technical chops of seasoned veterans. 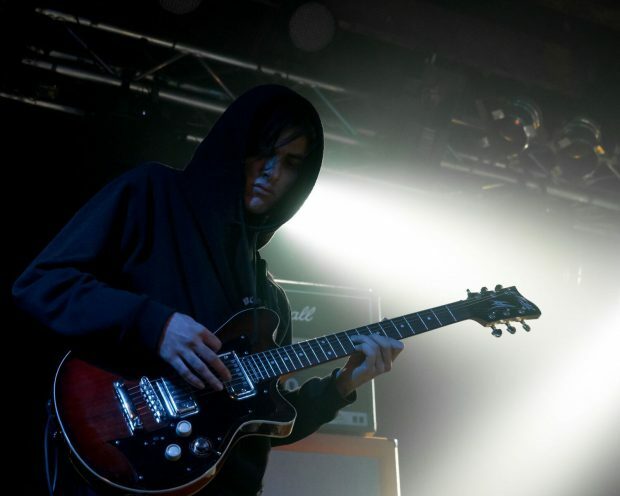 Despite looking way too young to have dabbled in mind expanding drugs of any kind, Yomi Ship seem to have gotten the art of creating tripped out psychedelic music down pat. Their virtuosic ensemble playing has a real fluidity and maturity to it that belies their tender age and was a real thrill to behold live on stage. Musically, it’s quite difficult to put your finger on where Yomi Ship are coming from. One can hear influences of prog rock, post rock, psychedelic rock, art rock and even jazz all playing off each other, sometimes all in the course of a single tune. Whist this scattergun approach to music making may be a nightmarish proposition in the hands of lesser bands, Yomi Ship have the advanced musicianship to make it sound like the most natural thing in the world. Not for them the stifling constraints of verse-chorus-verse rock and more power to them for that. Yomi Ship have a new EP out now called Moods and played several songs from it on the night, all of them sounding like the most adventurous thing you’ve heard in ages. Go check it out I say. Up next were Skullcave, another trio. But while Yomi Ship were all about subverting song structures and precision playing, Skullcave were more interested in melting faces and shuddering bones with titanic slabs of uproarious ‘doomgaze’ which is basically a blend of doom metal, post metal and shoegaze. For this reviewer, the coolest thing about Skullcave is the way they managed to ensure that their mammoth riffs never ended up getting in the way of their melodic sensibilities. Towering songs like new album track Next Earth and How To Tell When You’re Winning from the band’s Climbing EP are heavy as f**k but not to the point that it resembled a tuneless mess. Certainly, the way that singing drummer Liam Young and guitarist Jay Marriott harmonised almost telepathically really made for a cool melodic counterpoint to the intense sonic assault. Playing mostly material from their new album, awesome opening track Escape started off super quiet like a skeletal Mogwai track before bleeding into the gargantuan opening chords of sprawling new single Fear To Hide. On this evidence, the new Skullcave record is going to be well worth checking out. Perth psych rock legends Mt. 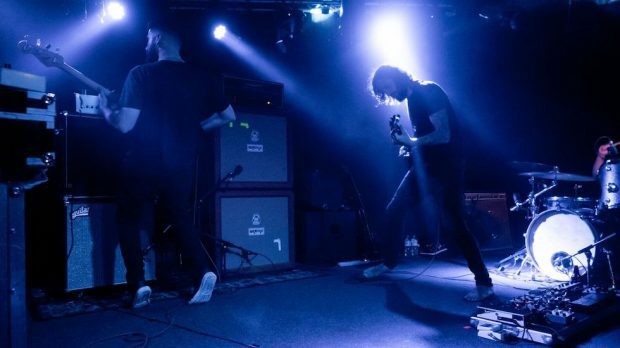 Mountain have always been bang on the money as a tight, five-headed drone rock beast live and once again they did not disappoint. Like Skullcave before them, Mt.Mountain showcased mainly new material from their forthcoming new album Golden Rise and judging from the new tracks that they performed on the night, the new record is going to pick up from where the band’s incredible 2017 album Dust left off and deliver us more of the dreamlike, droning psychedelic space rock that the band have made their impressive calling card. Mt.Mountain fans have already had their appetites for the new album suitably aroused by the brilliant lead single Cathedral, a hypnotic Spaceman 3-esque number given suitable forward propulsion by drummer Thomas Cahill’s scampering drumbeat and bassist Brendan Shanley’s mesmeric bass line. From the new album, the band also rolled out Shadow Walk, Open Door and the spaced-out title track Golden Rise, the aforementioned three tunes kickstarting the set in hypnotic fashion, all single note organ drones, blissed out vocals, sitar-like guitars, driving bass and taut drums working together in perfect unison to create a trippy, lysergic vibe. 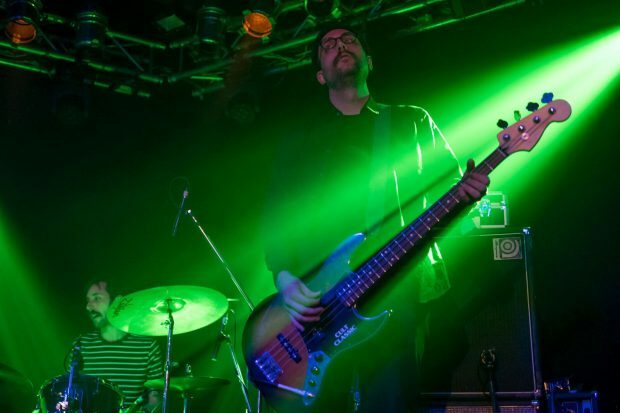 Set closer Elevation from the band’s 2016 album Cosmos Terros administered an unforgettable departing kick in the balls with its whirling dervish wah wah guitars, riffing bass machine gun drumming and Bailey’s ethereal “from-a-whisper-to-a-scream” vocals. As the final song in the set, it certainly left a lasting impression. One chord pummeled into sweet oblivion. To paraphrase Mick Jagger, it’s only rock ‘n’ roll but I bloody adore it. Saturday night at The Rosemount saw Tangled Thoughts of Leaving assembling a stellar lineup of talented local acts for an unforgettable launch party in support of their new album No Tether. Each band came, rocked out and delivered the goods in their own unique way. Over the course of four marvellous sets, the noise levels may have been dangerously close to being harmful, especially for those in the front row. But truth be told, a pair of ringing ears really is a small price to pay to be immersed in original music this potent. Myself, I’d gladly risk noise induced hearing loss all over again in a heartbeat, I had that much fun.